One third of the German population plays video games, spread out over almost all age groups, and that figure is still on the rise. But where can this journey take us? What is the potential of video games beyond the realm of mainstream entertainment? Those are just a handful of the fascinating questions that Next Level (link in German) was touching upon during its second edition in Düsseldorf from the 9th to the 12th of November. FLEGA had the chance to visit the exhibition thanks to the International Visitors Programme (link in English), organised by the NRW Kultursekretariat (link in English). The idea was to bring like-minded people from different countries (Belgium, The Netherlands and Serbia) together to discuss the future of digital culture as a whole and video games in particular. The festival featured some intriguing digital installations, game experiments and performances. In addition people could also take part in a Game Jam (powered by Ubisoft’s Blue Byte) or other creative workshops focused on e.g. lasercutting, Makey Makey, 3D printing, robots and tape art. As if that wasn’t already impressive enough, talks and performances were given both on and off the festival grounds. It is virtually impossible to cover everything that was on offer during the jam-packed 4 days of the festival, but below you can find some of our personal favourites that certainly made a lasting impression on us. Most of us play games for fun, but the medium can also be used to convey important messages. Thanks to embodiment (i.e. the player feels as if he/she is actually someone or something else) virtual reality in particular has turned out to be a very effective platform to stimulate awareness and empathy. 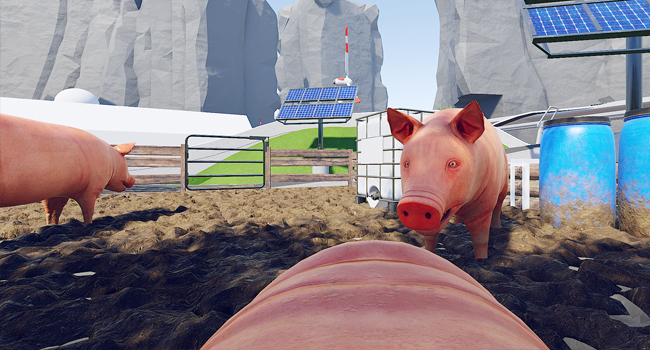 The experience is not always a pleasant one, as Pig Simulator demonstrates. This interactive VR game puts you in the skin of a pig. You start out on a farm, in relative tranquility, but inevitably meet your traumatic faith in the slaughterhouse. The experience is both powerful and disturbing. A fan of point and click games? Then you will probably enjoy this light-hearted interactive live performance called ‘Roland Klaut Das Klo’, which can be translated as ‘Roland Steals The Loo’. 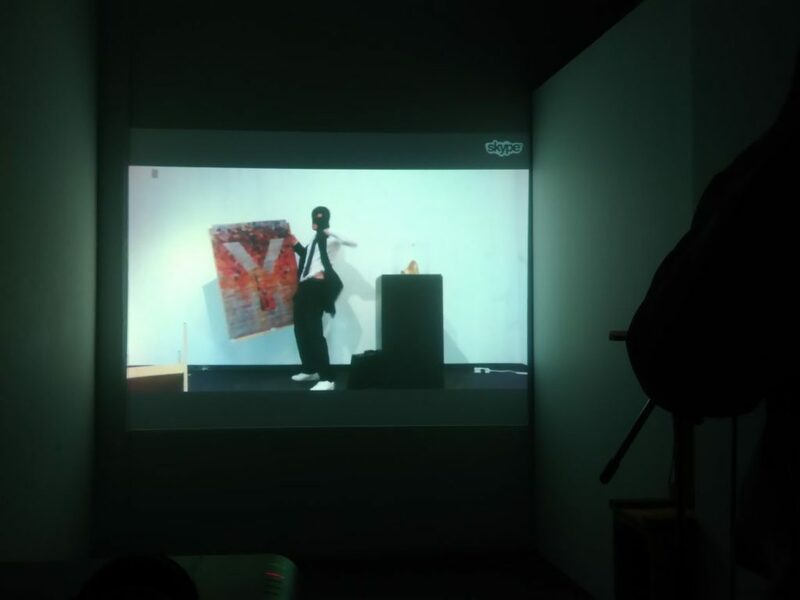 Three ‘players’ have to stand in front of a microphone and watch a live video feed to give realtime voice instructions to Roland, a masked art thief, played by an actual actor at a remote location. He is standing right next to a ‘Golden Loo’ art piece in a museum. The only problem is that he doesn’t have the key to the glass case protecting it. It is up to the players to give him the instructions he needs to be able to steal the piece before the guard arrives. Although the idea is not quite revolutionary, the fact you play with three friends simultaneously makes it a really fun experience. Yes, you read that correctly. We’re not talking about Paintball or Pinball, but PAINball. 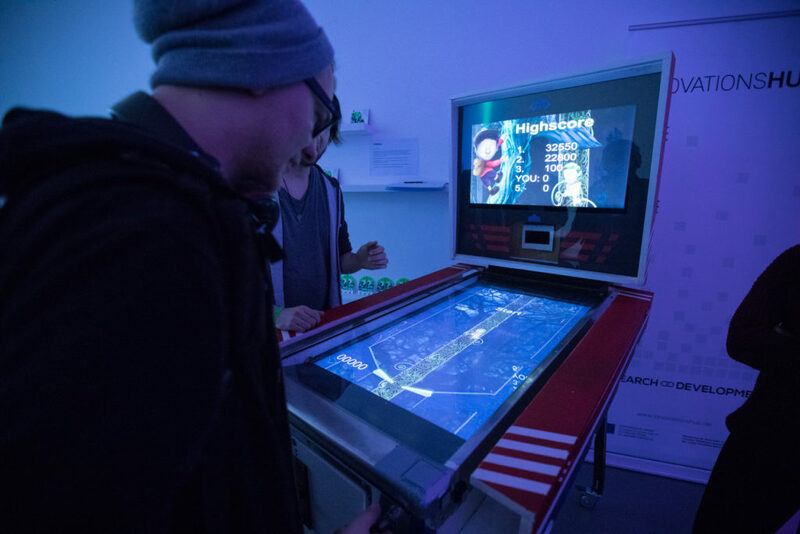 The game is actually an old pinball machine that has been fitted with a horizontal (for the leaderboard) and a vertical screen (for the playing field). The aim of the game is to bounce back the virtual balls that are constantly falling down to destroy obstacles on some sort of giant beanstalk that the main character is climbing automatically. If the player fails to do this in time, his/her hands will be electrocuted mildly. So now you know where the name comes from. The reason why we mention the game has nothing to do with the pain though. We’re just really enamoured by the way the students were able to create a really fun pinball experience with a beautiful aesthetic.